Okay, so I like D.H. Lawrence. I liked Lady Chatterley’s Lover and I liked The Virgin and the Gypsy. This one though… t’ain’t so good. It would beat Emily Bronte for the Most Depressing Book of the Year Award, and that’s even if she really actually tried to be miserable. It’s perfectly accessible and blessedly short, but I finished with the over-whelming urge to go buy D.H. Lawrence a puppy. Looking for acceptance from his new congregation, the Revd Ernest Lindley cannot long ignore the fact that his parishioners are far from welcoming. Rather than confront such hostility, the Lindleys instead become ever-more isolated: he ‘pale and miserable and neutral’; she ‘bitter and beaten by fear’. And having raised their children to be similarly dispassionate, it surely seems inevitable that their daughters should enter suitable, but loveless, marriages. Whilst Mary becomes the dutiful wife, younger sister Louisa vows to experience love for herself – little knowing that such desires will divide an already broken family. D.H. Lawrence seems to like the theme of contrasts in his book – usually between men and women, or the upper class and the lower. 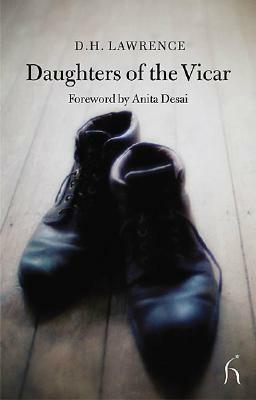 Daughters of the Vicar, however, seems to be slightly different in that it’s more of a contrast between… well, the daughters of the vicar. Mary has dark hair while Louisa is fair – Mary is willing to marry a man she dislikes for the sake of her family, whilst Louisa is disgusted and swears she will only marry for love. Even their love interests (and I use the term loosely) are polar opposites – Mr. Massy is ‘a little abortion’ while Alfred is a hulking, manly brute. It actually works very well, but the atmosphere has a very gloomy, poor-people-in-the-19th-century feel to it that seems to take over the entire book. The explanatory notes in my edition told me that this was one of Lawrence’s earlier works – a short story that was later broken up and various aspects used in his other books. It explains a lot. There isn’t a likeable character in the whole damn thing – Mr. Lindley sulks because his parishioners don’t like him and he’s poorer than he wants to be, while his wife lies on a sofa and whines. Mary, the eldest, is very virtuous… imagine if Meg Marsh was more annoying and had a baby. She married her husband for the good of the family, which naturally gives her the right to mope about being a martyr. Louisa, the younger sister, resents Mary for that (the only relatable thing in the book) while her own love interest is awkward and gauche. The plot itself isn’t too bad. It’s an old staple of classic literature – the whole ‘I will marry for love!’ thing. It’s nice, I understand where she’s coming from. Parts of it make made me so angry though, that apparently I kept pulling a (and I quote) ‘squinty cat face.’ The way Mr. Massy speaks to Mary is intolerable, but the ending especially made me want to tear my hair out. I can only hope that the majority of parents managed to refrain from speaking to their children like that in those days, because it was honestly beyond belief. So, you thought Insta-love was a modern, YA-esque creation? T’ain’t. We know that there is an Unsuitable Love Interest, but we’re not really told that Louisa even really likes him towards the end and I still couldn’t tell you what his feelings for her are. It’s kind of predictable but a little more explanation would have been nice. Okay, so this isn’t the worst book in the entire world. But it’s the worst book of D.H. Lawrence’s that I’ve read so far. It has a kind of dreary, monotonous atmosphere and I know that it’s meant to and it’s kind of the entire point, but it doesn’t make for the most enjoyable reading. That is one of my least favourite things: authors that decide to make their book the very thing that they're trying to depict/make fun of etc. If you want to show me that someone else's life is dull, there have got to be better ways than just making your reader bored to tears! It might be clever but it's just no fun. No fun at all. I'm glad you read this first because I've been thinking about reading more Lawrence (after liking 'Lady Chatterley's Lover') and I might have accidentally chosen this! Phewf! I was looking at LibraryThing and this is one of the least-read of his books. Possibly there's a reason for that… I liked The Virgin and the Gypsy? That's probably why Vintage and other publishers will only print the more well-known stuff (LCL, Sons and Lovers, etc) while books like this are left to the tiny publishers who only print them because they don't have to purchase the rights. Can't blame them for trying, I guess. I can't see Lawrence WANTING us to read this though lol. I still haven't read any D.H. Lawrence and entirely can't be bothered to try.. Okay, there's my confession out of the way. I'm reading.. or I started reading recently and quickly put to one side for a little while.. a book at the moment which is a kind of dark, historical, YA-but-I-would-not-recommend-to-a-young-adult-in-a-million-years-it's-that-dark, paranormal.. yeah. It's freaky bizarre, which normally I might be okay with but right now it's just bugging me and I had to put it down when I realised I was pulling as you call 'squinty cat faces' in the waiting room at the doctors. It also has the 'I WILL marry for love' trope in it. And it's a modern book! That trope never leaves, I swear.